The new institute drives scientific discovery using computational methods. Updated September 22, 2017, with new video. New York Gov. 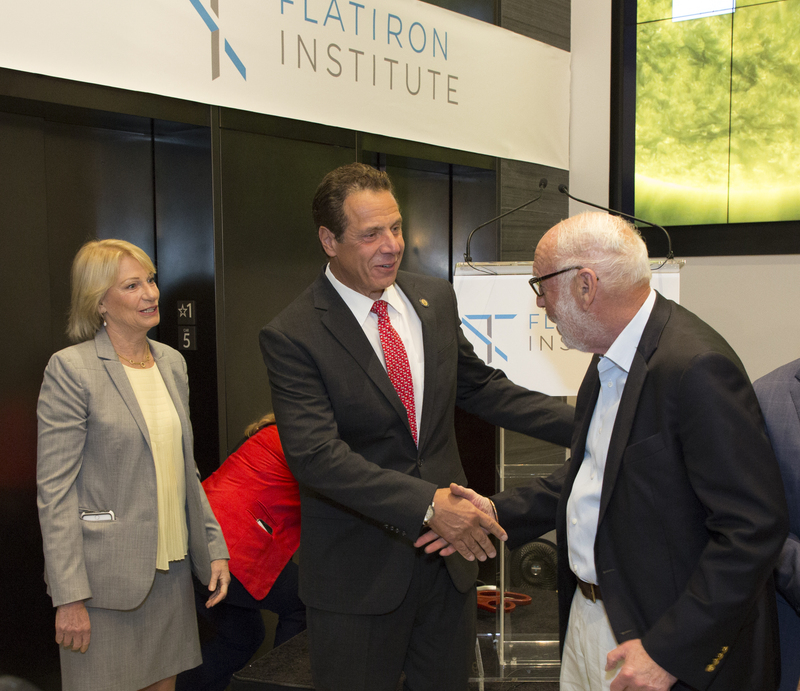 Andrew Cuomo joined Simons Foundation co-founders Jim and Marilyn Simons on Sept. 6 to dedicate the foundation’s new Flatiron Institute, an intramural research division of the Simons Foundation that tackles big datasets — and big scientific questions — by developing cutting-edge computational methods. Located across the street from the Simons Foundation’s New York City headquarters, the Flatiron Institute is an interdisciplinary research organization whose stated mission is to advance scientific research through computational methods, including data analysis, modeling and simulation. “New scientific instrumentation has created datasets of unprecedented size and scope, and this is the perfect time to establish an institute dedicated to [their] exploitation,” said Jim Simons. Since beginning operations in 2016, the institute has already attracted distinguished astrophysicists, biologists and quantum physicists. These scientists don’t need to apply for grants, which frees them to pursue long-term projects. “One of the critical opportunities that the Flatiron Institute has is that it provides a permanent home for professional scientists who are driven by the problem of developing and deploying and supporting state-of-the-art software, and that’s very hard to find in typical academic environments,” said Leslie Greengard, director of the Flatiron Institute’s Center for Computational Biology. Marilyn Simons, Gov. 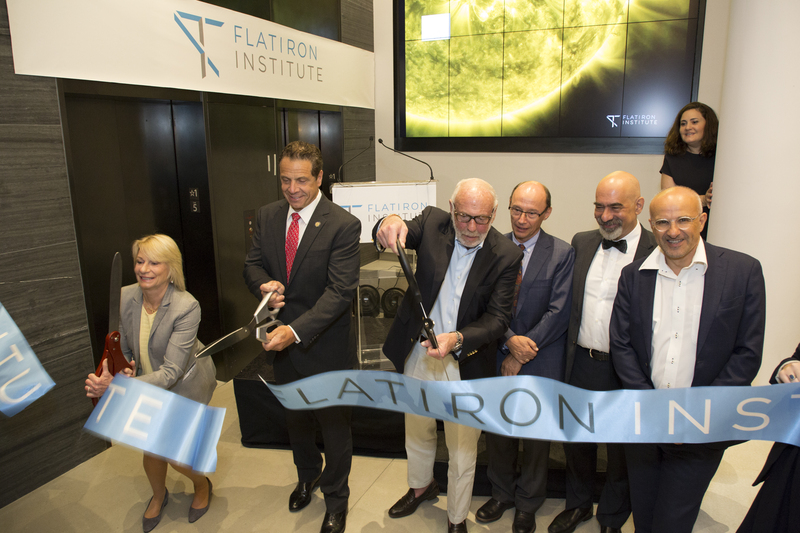 Andrew Cuomo and Jim Simons cut the ribbon during the Flatiron Institute’s dedication ceremony. Joining them, from left, were Leslie Greengard, director of the Center for Computational Biology; David Spergel, director of the Center for Computational Astrophysics; and Antoine Georges, director of the Center for Computational Quantum Physics. Gov. 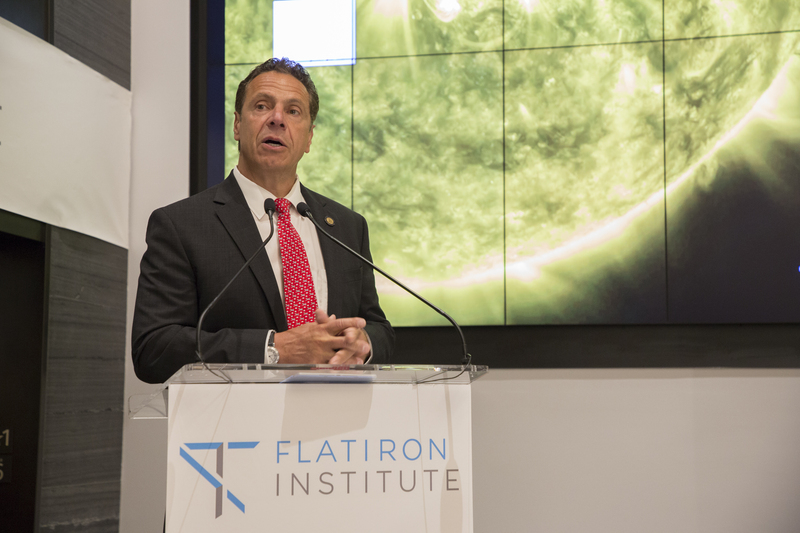 Andrew Cuomo delivered the keynote speech during the Flatiron Institute’s dedication ceremony. Gov. Andrew Cuomo, center, met with Jim and Marilyn Simons during the Flatiron dedication ceremony. From left, Gov. 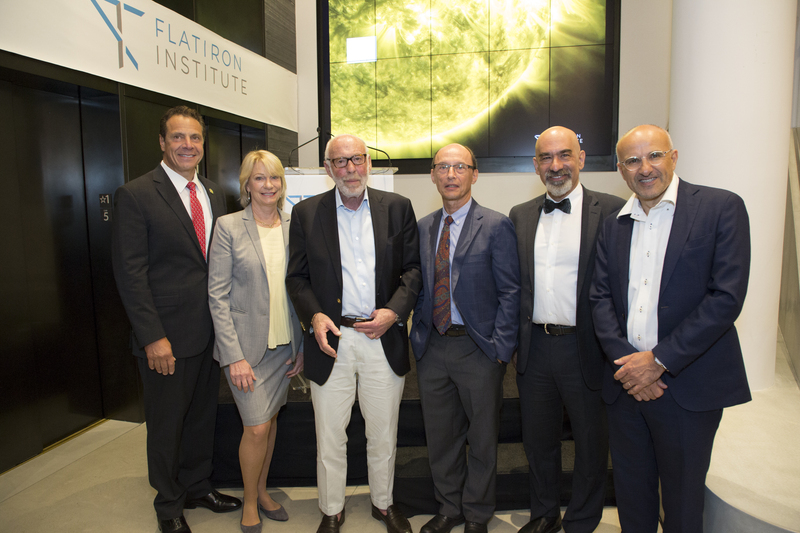 Andrew Cuomo, Marilyn Simons, Jim Simons, Dr. Leslie Greengard, David Spergel and Antoine Georges spoke during the ribbon-cutting ceremony at the Flatiron Institute’s dedication. At full capacity, the Flatiron Institute will house around 230 scientists and programmers, making for a sizable shift in the composition of the foundation’s overall staff. Marilyn Simons, the foundation’s president, said in her opening remarks that the addition of internal researchers to the organization has been inspiring. The Flatiron Institute’s location offers unique opportunities for collaboration, said David Spergel, director of the Flatiron Institute’s Center for Computational Astrophysics. “Our unfair advantage is New York,” he said. “It’s a place where we’re surrounded by great universities and where we have the opportunity to partner with them.” Many senior researchers within the institute have joint appointments at nearby universities, including New York University, Columbia University, Princeton University and Stony Brook University. The institute will also become an important hub for science regionally, predicted Gov. Cuomo during the ceremony’s keynote address. “This is where we need to grow and flourish” in New York State, he said. Antoine Georges, director of the Flatiron Institute’s Center for Computational Quantum Physics, went a step further, saying that the Flatiron Institute offers a unique opportunity to gather together scientists from different fields who share a common interest in the application of computation to science. “The institute will be a focal point for computational sciences internationally,” he said. The Flatiron’s in-house science team is split across its three centers, each focusing on a different scientific field. A fourth center focused on an additional discipline will be designated in upcoming months. The Center for Computational Astrophysics creates new frameworks for analyzing vast astronomical datasets and for modeling and understanding the complex physics that governs the universe. The Center for Computational Biology develops modeling tools and theories for understanding biological processes and analyzes large datasets from new experimental techniques. The most recent addition to the Flatiron Institute is the Center for Computational Quantum Physics, which began operations on Sept. 1. Under the leadership of Georges and co-director Andy Millis, the center develops the concepts, theories and algorithms needed to solve quantum many-body problems and predict the behavior of materials and molecules. The Scientific Computing Core within the Flatiron Institute maintains the institute’s computing infrastructure and, in collaboration with the scientists, helps develop new computational and statistical tools for use across the scientific community. The core is co-directed by Nick Carriero and Ian Fisk. The core’s mission is to “remove the technical roadblocks so that the remarkable team of scientists that Marilyn and Jim have assembled can focus on the hard challenges of their science,” said Fisk. “The support of the Simons Foundation permits us, as best we can, to ensure that the research community is only limited by their imagination and their initiative and not by the computing resource requirements and technology.